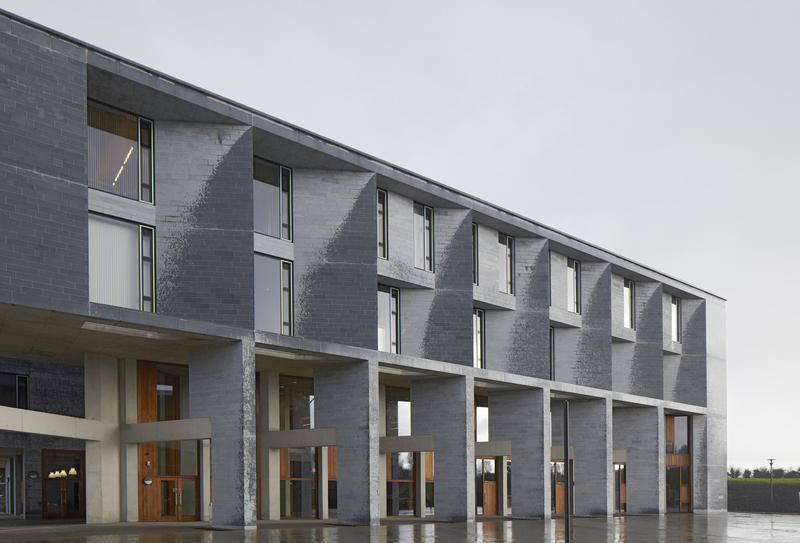 I have recently watched the BBC News documentary on the RIBA Stirling prize shortlist for 2013. Its worth a watch – and can be found on BBC iPlayer. 1. Astley Castle. A modern intervention to form a holiday home within a medieval castle/ scheduled ancient monument. The dilapidated ruin, of which the UK has many, faced an uncertain future, but the innovative idea of creating a ‘new chapter’ for this structure is an interesting concept. However a building which presumably was open to the public has now taken on a more private use – is this the right thing to do with a building of such historic importance? 2. Bishop King Edward Chapel. 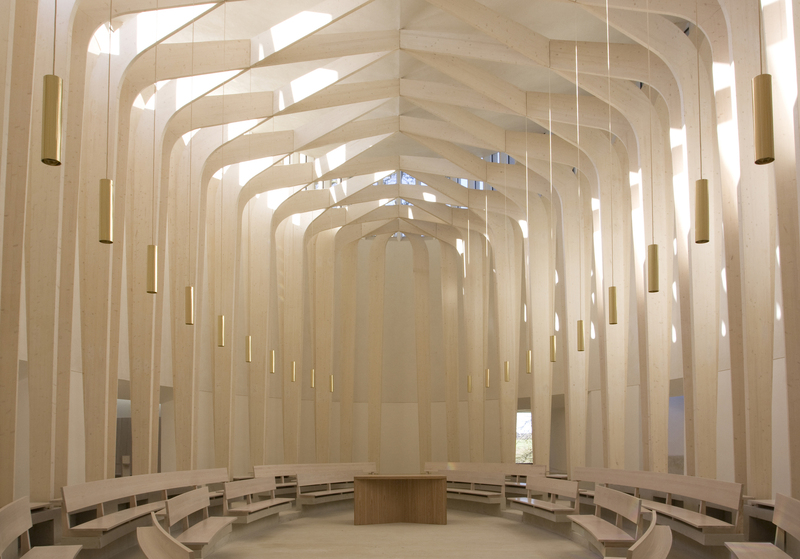 The brief was to create a contemplative and prayerful environment. The chosen design was conceived as elliptical boat-like structure within the Oxfordshire countryside. The architecture is simple, modern, bright and light. An uplifting interior has been formed which certainly provides the ‘wow’ factor according to its users. I think this is a sensitive and positive interpretation on creating a modern place of worship, which is always a difficult thing to achieve I believe. 3. Giants Causeway Visitors Centre. Certainly a building which blends into its environment. It only really has two part-elevations as the structure is submersed into the ground. However the visible external elements are clad in Basalt rock (to match its context). Internally it is very efficient in its energy usage via various sustainable systems employed. The interior is rather organic in its planning, “there is no set route through the building”; its open to user interpretation. Clearly a very public building, and a well recieved one it would seem at that. 4. Newhall Be. A new concept in greenfield high density living. Or is it? These black timber-clad boxes promote big windows and open plan internal/ external spaces for the modern needs of housing. However, this scheme is just one part of an extensive ‘new thinking’ residential development in Harlow, Essex. Around ten years ago I visited the recently built Proctor Matthews development called Abode. This was one of the first phases on this site at Newhall. In my opinion the Abode scheme is far more successful than Newhall Be as a modern interpretation of ‘the housing estate’. 5. Park Hill. A huge project on the top of a hill in central Sheffield. An iconic concept of ‘new living and streets in the skies’, when first built in the late 1950’s, It’s design was inspired by Le Corbsier, but it suffered social decline and dilapidation over the years. Urban Splash have delivered a very positive conversion of the scheme to create high density living which enjoys two-storey dwellings, with large open-plan living and big window views out. Commercial uses have also been introduced at ground floor. I have seen this project emerge over recent years and have the utmost respect for Tom and Jonny in their work. You have to admire this project, if only for its sheer scale! 6. University of Limerick Medical School. The second Irish project in the mix. This is good design, delivered to a budget. Exposed materials internally create spaces which are flexible, but perhaps appear too basic? A new academic building is the main event, whilst three residential blocks (student living) surround it. I think this image sells it best, but otherwise it doesn’t seem to stand out? So my vote? Park Hill by Urban Splash. Modesty, Harmony, Make do and mend. Natural Light features highly in all buildings through large windows/ openings. Do these six buildings represent the ‘cream of 2013’, I’m not so sure personally. I think there are others which should perhaps be in there. Does it lift the spirit or corrode the soul? I think these points are valid. In a world where “austere” has become somewhat of the norm over recent years, the challenges facing architects are ever-increasing. ‘Signature designs’ are perhaps becoming a minority. A much stronger focus on form/ function and user experience are without doubt the most important factors in achieving the best quality contemporary architecture. So whats ahead? I think we are seeing an emergence of what I’d call ‘layered’ buildings. These are buildings which have a highly insulated functional envelope, but are then over-clad in a further layer of decorative external facade, this offers aesthetic and functional benefits. An example would be Mecanoo’s new Birmingham Library.